Amoney Show Train Music llc #WuWednesday https:..
Not just music, its a Wu-Volution!!!! Join the movement to reclaim TRUE Hip-Hop. 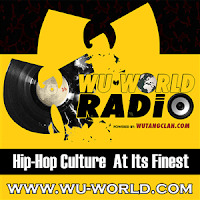 Tune in to Wu World Radio 24/7 for the hottest Real Hip-Hop Music being broadcasted right out of Wu-Tang Management's Head Quaters in Staten Africa AKA Shoalin, NY.